Wow, day 29? That means there are only a couple more challenges left! As for today, we have the supernatural. 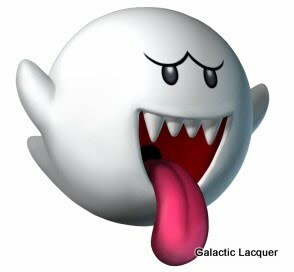 I thought of a lot of ideas again, anything from Van Helsing to Ghostbusters, but for some reason, I just liked the idea of Boos from Mario! I was dying to use this lovely Orly color I had bought from a blog sale, and I thought it would make an interesting base color for my ghosts. The color is called Fowl Play, and it's a deep purple color with some flakies inside. The flakies shift from green to orange, and appear mostly orange from straight on. Then I freehanded my Boos over it! I only did two so it wouldn't be too cluttered, though I was tempted to do more! I use Cherimoya nail art polishes in White, Red, Charcoal, and Barbie Pink for the details. They have sort of weird eyes, but they're not crying! Also the red is sort of jagged for their mouths since they have crazy pointy teeth. I guess someone could argue that they're not entirely supernatural since they from Mario video games. But then again, the existence of anything supernatural is arguable!